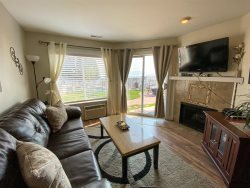 2 Bed, 2 Bath Condo in Harbor Village. Sleeps 8 in Beds (Max occupancy is 12). Two bedroom condo in Harbor Village. 1,200 square feet on two levels. Parking Rules: Renters are allowed 2 parking spaces at the condo. No trailers, boats, or RV's allowed to be parked at the condo. There is an overflow parking lot for additional vehicles and trailers. Note: This unit does have free Wi-Fi. Free Wi-Fi is also available at the office.